How is it that during life shattering trials and events we are able to remain joyful and full of faith? What is Faith and why are we able to have such faith? Many mockers of Christianity have tried to teach that faith is the opposite of confidence and knowledge, but they are 100% wrong. Faith is trust in what is certain & knowable. Because of the faithful, reliable and completely accurate Word we have from God our Creator, when he promises something, we are able to have complete confidence it will happen just like He has said. When we are told that Jesus died on the Cross to pay for our lawless actions and that he is returning again soon, we have a confident assurance that it will happen exactly as God has told us, because His Word is reliable. Because we don’t yet see Jesus, we have Faith in Him. Because we haven’t yet reached glory, we have Faith it is coming. So Faith is not wishful thinking, it is NOT the opposite of knowledge and confidence. It’s because of knowledge and confidence in God’s word and His promises that we are able to have Faith in Him. This faith though is useless if it’s not faith in the right thing. If the object of your faith is faulty, your faith won’t mean anything. Consider this, you’ve gone abseiling with a friend. 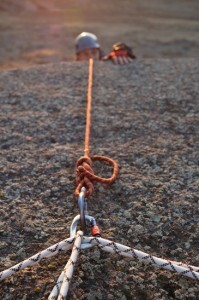 You find two anchor points at the top of the cliff to connect your rope and harness to, one is made of steal and is drilled into the rock, the other is made from cheap plastic and is only glued to the dirt. You decide to connect yourself to the steal anchor point because of your knowledge of it’s strength and security. Your friend who knows nothing about abseiling, safety or gravity decides to connect to the plastic anchor. Now before either of you are able to go over the edge of the cliff you have to exercise faith in your equipment. You have to at least trust that it will hold you. Hebrews 11:6. But without faith it is impossible to please Him, for he who comes to God must believe that He is, and that He is a rewarder of those who diligently seek Him. But how much faith do you need for your anchor to save you? Only enough to use it. The strength and safety is in the anchor not the quantity of your faith. What about your friend with the dodgy anchor point. If he has faith like a mountain, will that save him? No, because his faith is misplaced. It doesn’t matter how much faith he has, it WILL NOT and CANNOT save him. But you only need a small amount of faith to be safe, because the object of your faith is able to save. Likewise, non-christians & merely religious people may have more faith than Christians, but their faith is in the wrong object and therefore it cannot save them. But if your faith is in Jesus Christ, then you can have absolute trust that He can and will save you. Not because your faith is so great, but because our Saviour is so great. The more we learn about our Lord, the greater our Faith will grow. If the size of your faith doesn’t effect your ability to be saved, why do we need to grow our faith? The reason is, the faith you have will directly effect the way you live out your life. Your back at the top of the cliff, and your friend says to you, “You know, rock is not very strong. It’s so old and out dated and there is no proof it can actually hold you”. If your knowledge of rock isn’t very good, your faith could be shaken. Then as a result, as you abseil down the cliff, you’ll find yourself creeping slowly and gently saying to yourself “please don’t break, please don’t break”. Your shaken faith will directly impact the way you act. But if you spent time learning everything about the rock and your attachment to it, your faith would be increased and you could fly down the cliff, bouncing, swinging, with joy in your heart and even help others who may be stuck, all because you have sound faith in a proven and secure anchor point. Likewise, many Christians creep through life saying to themselves, “I hope I’ll make it, I hope I’ll make it” because of a lack of biblical faith, but if their faith was strong in the knowledge of their Saviour and His word, they could march to glory with joy and even be outwardly focused enough to help others.